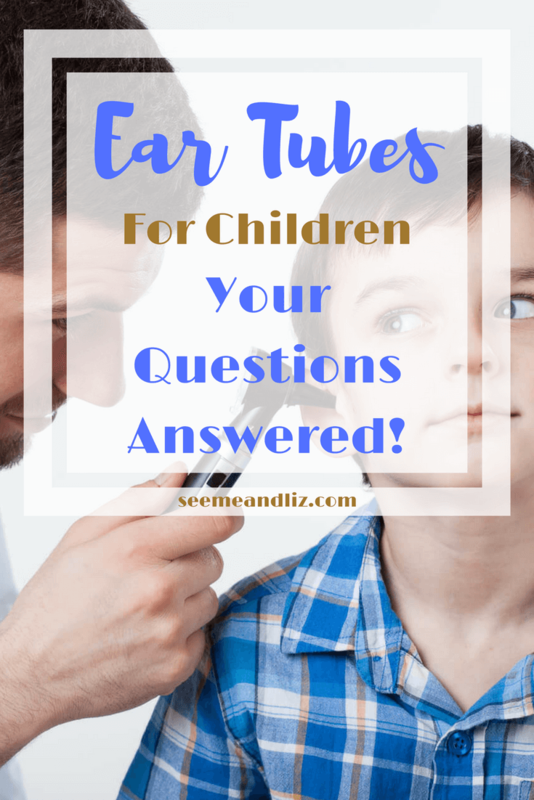 Ear Tubes For Children – What You Need To Know! 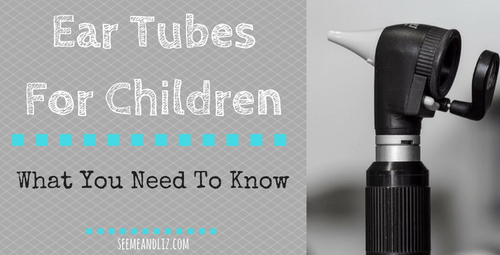 Seeme & Liz > General Parenting Tips > Ear Tubes For Children – What You Need To Know! Ear tubes for children go by many different names. You may have heard these tubes referred to as myringotomy tubes, tympanostomy tubes, pressure equalization tubes, drainage tubes or ventilating tubes. These tubes will most likely be recommended by an Otolaryngologist, or Ear, Nose & Throat Dr. When Are Ear Tubes For Children Necessary? When I was practicing as a speech therapist, this was a common concern that many parents came in with. You as a parent are doing everything that you should be doing, yet your child is not babbling, vocalizing or making attempts at speaking. Maybe you hear your little one making a sound or 2, but nothing to get all that excited about. The first thing that I would always recommend to parents (assuming all other areas of development seemed to be progressing “normally”) is that they take their child to see an Audiologist. An audiologist can test your child’s hearing to make sure that there is no hearing loss present. Often upon my recommendation, parents would say to me “I am pretty sure my child can hear, he looks at me when I am talking and he startles when a door slams”. It indicates that your child is not deaf and in fact, is able to hear. However, it does not pin point how much your child can hear. Some sounds are very quiet and subtle, so if your child has a hearing loss (mild to moderate) she will hear some sounds, but not necessarily all of them. When a child is first learning language, he needs to hear the words around him as clearly as possible. If there is any “muffling” of sounds (think of what it sounds like when you have cotton in your ears, or when you are underwater) your child will not be able to repeat them back and therefore will not make attempts to “talk”. Envision yourself learning a new language. This would be challenging in and of itself. Now imagine learning that language with cotton in one or both ears. How challenging would it be to learn a new language when you can’t hear every sound clearly? There are many reasons why your child may have a hearing loss. A hearing loss can be present at birth, or it can be acquired later on. For the purpose of this article, I will discuss hearing loss that is caused by fluid in the ear. Fluid in the ear? What is that all about? When children experience ear infections (and many children do) fluid builds up behind the eardrum. This fluid is what can cause a hearing loss. Most children will have symptoms associated with an ear infection such as: fever, indications of discomfort (pulling at ear and crying), general unhappiness. But, there are some children that have fluid behind the eardrum that is causing a hearing loss but they do not show any signs of an infection (my daughter was one of these children). If your child has ear infections that last 3 months or more despite medication, or if your child experiences 3-5 or more ear infections in a year, myringotomy tubes may be recommended. But, in my daughters case, she only had 2 “known” ear infections with symptoms in her first 14 months of life. Luckily due to my knowledge of language development, I knew something wasn’t quite right because at 12 months old, she was barely babbling. I took her to see an audiologist who said there was fluid present in her ears, and her hearing was effected. I later found out that she probably had fluid in her ears for months with no indication of an infection. My Child Needs Tubes – Should I Be Worried? Drainage tubes for children are actually quite common. Parent’s often become worried when they find out that their child needs them as it is a minor surgery that is usually done in a hospital on an outpatient basis. The procedure itself is under 10 minutes, however the child will require an anesthetic. There are benefits to these types of tubes for children. I know parents do not want to see their child in the hospital, however the outcome is well worth it. My daughter had ear tubes inserted twice (the tubes are tiny and can fall out after several months to years). A “clumsy” child may no longer be so clumsy. Fluid can throw your child off balance, quite literally. 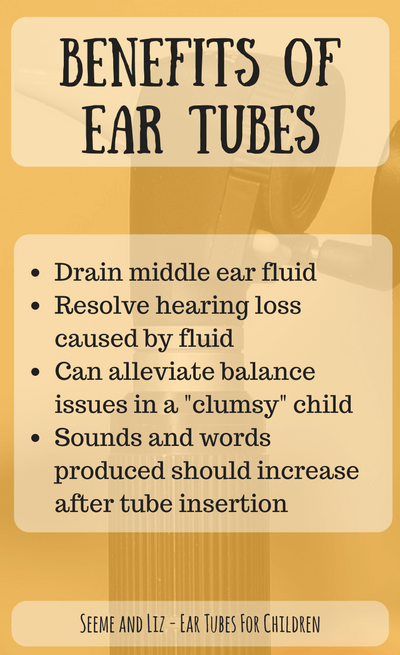 What Do Ear Tubes Have To Do With Play Skills? The short answer, nothing and everything! Your child will probably still demonstrate age appropriate play skills despite having a mild to moderate hearing loss (this is the type that you would probably see due to fluid in the ears) if you are engaging her in play. Even though your child may not be hearing everything properly she can still see and follow what you are showing her. However, play is so important to language development because of all of the opportunities to learn new words and sentences. If your child cannot hear everything that you are saying perfectly clearly, he will not be able to make sounds or say new words. So while it is great that he is playing, and his play skills are developing, his language skills will be lagging behind. Will You Give Ear Tubes A Chance? I strongly encourage you to not fear your child getting tubes inserted if her language development is not where it should be and a doctor has indicated that there is fluid in your child’s ear that is causing a hearing loss. A doctor will not recommend ear tube insertion if it is not warranted. Hearing losses caused by fluid in the ear can be reversed, resulting in no permanent hearing loss, if dealt with in a timely manner. 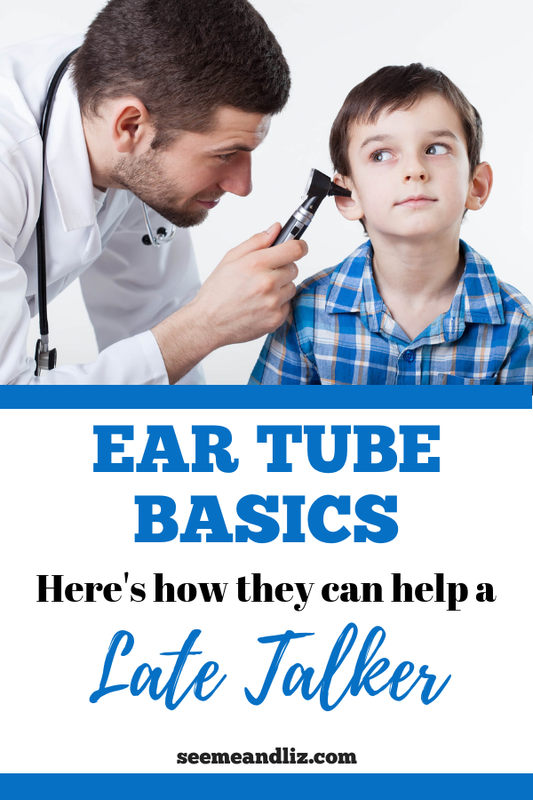 Does your child have ear tubes? If so, how have the tubes helped their language development? I would love to hear your answers! I am so relieved to read that there are many similar stories! But, I am also very angry that there is not enough awareness! My son will be turning 6 in a few months. He needs ear tubes. He taught himself to read and write all letters and numbers between the ages of 2 and 3, and even some sight words and math. That is not a brag because he didn’t talk much. He went for check ups every 6 months and never had an ear infection (to my knowledge), which I was grateful for since both his dad (who had tubes) and myself suffered from them throughout childhood. When he turned 5 the “diagnosis” started: autism (but very mild due to speech delay so no follow up and don’t bother telling them when he starts school??!!! ), MERLD (but the speech pathologist could not complete the test). He has excellent coordination, plays with other children when he feels comfortable, but does not like to talk, sometimes to the point of being ashamed. He always has, however, watched others carefully and learned VERY rapidly. So finally last month the audiologist for his school district did a hearing test. He has fluid build up and God knows for how long. Never once was this ever mentioned as a possibility for his speech delay or his lack of often misunderstanding oral directions! This should have been the first test done, not the last! I had no idea there could be fluid with no pain! The pediatric ENT told me my anger was justified. At a parent conference in the fall, I had to show them a video of him reading out loud(when he is comfortable he will read and talk using high vocabulary). They were shocked because he had not talked much at all and so they immediately assumed developmental delays, autistic, low-functioning and treated him as such. In fact, he may very well likely have Einstein’s syndrome, in which speech delay is a hallmark, despite the fluid build up obviously contributing. The kicker is…I have 2 master’s, one is an M.Ed in Reading. The teachers, the GPs, the speech pathologist, and the autism expert all gave me that “awww…she won’t accept it” look. No, I didn’t accept it because they were wrong. Moms(and dads) KNOW. The “experts” often jump to conclusions and are quick to “label” when the simplest of answers just might suffice. I can only pray that when he gets his tubes there is no permanent damage and he can overcome his extreme shyness. Blessings to all of your precious children! Thanks for your message. I am really sorry to hear what you have gone through with your son. But it sounds like you are on the right track. 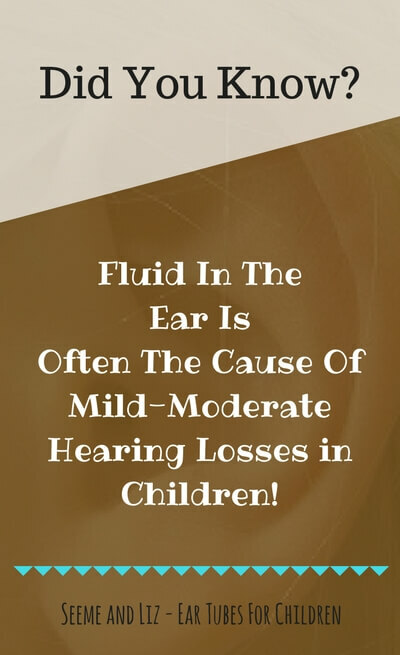 It is rare for a child to have fluid in the ears without signs of an ear infection but it does happen (like in the case of my daughter and your son). You mentioned that your son can talk and when he does, his vocabulary is quite good. When your son does speak, how is his pronunciation? If he is struggling to produce sounds properly then this could be an indication of a hearing loss in this situation. Does he speak more at home than in school? If so, has anyone mentioned selective mutism? I am not an expert in that area by any means, but it may be something to look into. I would love it if you could keep me updated, especially after the tubes are put it. I wish you and your son all the best! It sounds like you are a great advocate for him. Thank you, Tanya, for your wonderful response! I actually did look into selective mutism a bit, and many of the characteristics do fit, but many don’t (like many disorders). He does have trouble sometimes distinguishing between certain sounds when they are spoken. For example, my aunt has an Alexa. When he met her for the first time at their house, he wouldn’t say a word until her husband showed him the Alexa. He called it “Aleska” and got mad when it didn’t respond (I know that’s not funny, but he kept saying “Aleska! ALESKA!” and it was so cute.) But, he opened up and started talking right after that. Some people he will warm right up to, others he won’t. He mumbles and points quite a bit to avoid talking. But, when he wants to get his point across, it is perfect and with perfect grammar. He talks at home a lot, but he’s not big on conversation. He also, thanks to Thomas, speaks with a British accent when he plays with his Thomas toys. His first “word”, was a sentence at 1 1/2 (I did it! ), and he never said mama, or dada, or baba or any babytalk. He said words and sentences. There is obviously a hearing problem, but how much that has delayed his willingness to talk much socially I don’t know. He also spent his first four years accustomed to understanding and speaking Spanish at a private sitter’s. Interestingly, he never spoke it at home, just there. I did a lot of research and the closest “disorder” he matched was Einstein’s Syndrome. Except for the family being musically inclined, the rest of characteristics match to a T. I think he is shy by nature, and the unfortunate hearing loss because of the fluid compounded it. I will certainly keep you, and everyone else who reads the posts, informed. There are so many explanations for language delays and sadly, even though many are just a natural occurrence for some children who are just fine, too many times they are misdiagnosed. But from my personal experiences, checking hearing should be the first on the list. The people who had doctors that were able to catch a hearing loss when their children were 1-3, are very blessed to have had that care and remedy the problem ASAP. Again, blessings to everyone reading and their children! Sharon, you really have been through a lot. Unfortunately it can take time to really figure out what is going on with some children. I wish I could offer more advice and suggestions, but I cannot because I don’t know your son and I am no longer practicing as a Speech-Language pathologist. But you are very knowledgeable and want the best for your son so I am sure he will get the support he needs! You’re right Liz. Some kids do get misdiagnosed because when a young child doesn’t hear properly they often act out. Having a child’s ears checked is quite simple. A few ear infections are normal and to be expected. I found your article to be very enlightening. I have heard of kids getting ear tubes but did not quite understand how and for what they were used. I have 2 young children and fortunately for me we have not had any issues with their speech or balance etc., however, I now know what to signs to look for should they start acting differently and what the possible reasons could be. Thanks for your comment Matendi. If your children are over the age of 3 and haven’t needed ear tubes then there is a good chance they won’t end up needing them. The majority of children requiring drainage tubes get them before the age of 3. Very informative article that reveals the little tell tale symptoms to look out for in our children before heading to the audiologist in the first place. Just wondering if there are ear tubes for adults and the elderly? It would be nice we all have regular ear drainage to clean out those tubes and who knows, it might help us talk just a little bit quieter. There definitely are symptoms of ear infections that parents can be on the look out for, but there are some children who don’t show symptoms of an ear infection and have fluid behind the ear drum. I actually encourage parents to take their child to an audiologist if they have any concerns. When it comes to speech-language development it is better to take action sooner rather than later. As for adults/seniors, tubes can be inserted if they have ear infections (excess fluid) that is causing a hearing loss. This would be the only case. If the ears are functioning normally there would be no need for tubes. This is a really interesting article. I definitely have a few friends who this could help out and who could find it interesting. I know this isn’t the topic of your article but I have a little boy who is the opposite. He doesn’t stop screaming (unhappily) and its SO loud, I wonder whether he can’t hear just how loud it is, and if there might be a hearing problem this way. What do you think? Thanks for your question. First of all, how old is your son? Second of all is he meeting all other milestones? If you are unsure you can take a look at Ages and Stages – Language Development Milestones. If he is meeting all of the milestones for his age group then it is most likely nothing to be concerned about. Some kids are just louder than others. However, if you ever are concerned with your son’s hearing, have him seen by an audiologist. Or if there are concerns with his speech and language development have him seen by a speech therapist. Very interesting! It leads me to wonder if my child gets so engrossed in what he is doing that he shuts out everything else, or does he perhaps have some form of hearing loss. He did have a few ear infections in his younger years, so I think it will be wise to take him for a visit to an audiologist. Thanks for the heads-up. I think it is easy for us to miss what we think are minor things that can be so important in the long-term. I am happy that you found the article helpful. As I do not know your son or his age, I cannot make any specific comments regarding his hearing. It is however normal for children to “tune out” their parents. My son is 6 and does this all the time. If your son’s language is developing normally and he only had a fewear infections I would assume his hearing is fine. But, as I always say, you are the parent and you are your child’s best advocate. So if you ever feel there is something wrong, then by all means, have him checked out. Having been born with a hearing deficit that wasn’t discovered till I was nearly in my teens, I understand the frustration of not being able to communicate properly. In those days, there wasn’t so much help and hearing problems often went undetected. Although ear tubes wouldn’t have helped in my case, I’m sure there were many children who “slipped through the net” who could have benefited from them. My granddaughter is 10mths old now and is making plenty of attempts to for words and babbles constantly, She definitely doesn’t need ear tubes! It sounds like your granddaughter is right on track for speech and language development. Sounds like there is no need to worry where she is concerned. Although ear infections can occur at any age. However, once speech and language is established a mild hearing loss due to fluid in the ear wouldn’t have as many negative effects as it would for a child who is just learning a language. You obviously know what it is like having had to deal with a hearing loss yourself, so I am sure you will be a great advocate for your grandchildren. Now you know what signs to look for if there ever are any issues with their speech and language development. Tanya – this article is so well written and clear. I hope every parent sees this. This information on ear tubes for children should be handed out to parents when they take their child in for their 12 month wellness check! I know that I have had ear infections and other problems which have caused me to have water in my ears causing the very issues your are referring to – muffled hearing, loss of balance, and a general feeling of disconnection to those around me. I know how frustrating it was for me as an adult to suffer from this, and I cannot imaging how frustrating it would be to a small child just learning to get around in the world and with no method to communicate that there is a problem! Your website is coming along so nicely and you really do provide wonderful and educational content! I agree with you that this kind of information should be given out at wellness checkups for babies. Most parents aren’t aware that their child’s speech could be delayed because of a hearing impairment stemming from fluid in the ears. As I mentioned in the article, my daughter did not have many known ear infections (ear tubes are typically recommended after a child has 4-6 ear infections in one year) but because of my background in speech and language development, I knew something wasn’t right. I am glad I went with my gut and had her assessed. Also, when children are just learning a language and they aren’t hearing everything properly it will have a great impact on their speech. Either they won’t say much at all, or what they do say will sound like jibberish. It seems like you know what I mean as you have had issues with your ears yourself. Thanks for taking the time to check out my site and read my articles. I am glad that you find them informative. You are welcome. I hope that you found the information useful. What’s the general risk of having the tubes inserted? Is there a risk of damaging the ear drum? The risks are possible scarring or weakening of the eardrum or the eardrum failing to close once the tubes fall out or are removed. And as with any surgery requiring anesthetic, there are risks associated with getting an anesthetic. However, in my career as a speech pathologist and having been around many children with ear tubes, I do not know any that were caused harm from the tubes. Personally I feel the risks are greater not getting them because if a hearing loss is present a child’s speech and language skills will continue to be delayed. This is very informative,thanks so much and im sure parents with little kids will really appreciate your site. You did a great job explaining everything in an easy to understand way. Wow. This makes me wonder how many parents are thinking their kids are just taking their time with speech or need speech therapy when they actually may have fluid in their ears. Poor little guys! Thanks for shedding light on this topic – it could potentially give the green light to parents to ask their pediatricians more questions. It is actually very common for parents not to think about hearing, or lack thereof and how it may influence language development. This is not something we are taught as parents. I am hoping that my site will help parents with regards to their child’s language development. Wow, I think this site was tailor-made for me! I have a 6 year old son who has been in speech therapy for the last 3 years. You are very right; the first thing doctors do is to check their hearing with an audiologist. My son’s hearing turned out just fine. Thank God! But I am always looking for new information to help him better develop his speech. I am glad that you like the information on my site. If you want to receive updates of the posts, please subscribe to my newsletter! I will be sending it out twice a month and it will have the latest blog posts in it. That way you won’t miss out on any new info. I am happy to hear that you had your son’s hearing checked. That is always the first thing I would recommend. Of course there are so many other reasons why a child might have a speech and/or language delay.